It can be said that if every appliance were exactly the same our job would be a lot easier, but unfortunately that is not the case. There are numerous makes and models in the home and although the same types work similarly; there are some differences that must be noted. 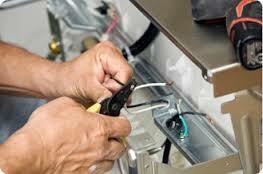 We are passionate about appliances repair. We are committed to administering kitchen appliances repair in Whitby, Ontario that meets and exceeds our customers’ requirements. We have earned the reputation of being the kitchen appliance repairs specialist in the Whitby community. This reputation was made possible by thousands of logged in hours working hard for our customers in the area. We have worked on every appliance you can think of. We excel with washers, dryers, refrigerators, stoves, ovens, and much more. If it is broke we can fix it. We don’t care what make or model it is we can provide the affordable resolution you need. Our Whitby Appliances Repair team is simply the best at what we do. We service every type of oven and stove. We work on gas stoves and electric stoves as well. We can replace bad stove top burners and smooth top heating elements as well. Our experts can fix bad switched, oven heating elements and damaged power cords too. On the refrigerator/freezer unit in your home we can make the proper repairs on the double. We can make small appliance repairs as well. It is hard to find a service provider anymore that won’t throw in a few hidden costs to increase their average invoice amount, but Appliances Repair Whitby does not do business that way. We would rather win our customers over with good old fashioned quality service provided at reasonable rates. Contact us and we will respond urgently to provide some of that superior service for you.